A story that strikes certain readers as inspiring and others as repulsive? At least we know it was memorable. Entry filed under: The Penn Stater Magazine. Tags: Dirk Van Velzen. I’m going to go with inspirational. Ultimately though, the jury will be out until after Mr. Van Velzen reenters society. I think what is repulsive or disgusting is that we live in a country of overcrowded prisons where, for the most part, we do nothing to rehabilitate them. These people will be back out on the streets someday and we should be doing everything we can in the meantime to changes their lives and create productive citizens. If Penn State can educate an incarcerated individual and change their lives then we are changing society, one person at a time and that’s a good thing. I’m on the side of the inspirationals. The jury is still out, of course, but we do know that education is usually beneficial. 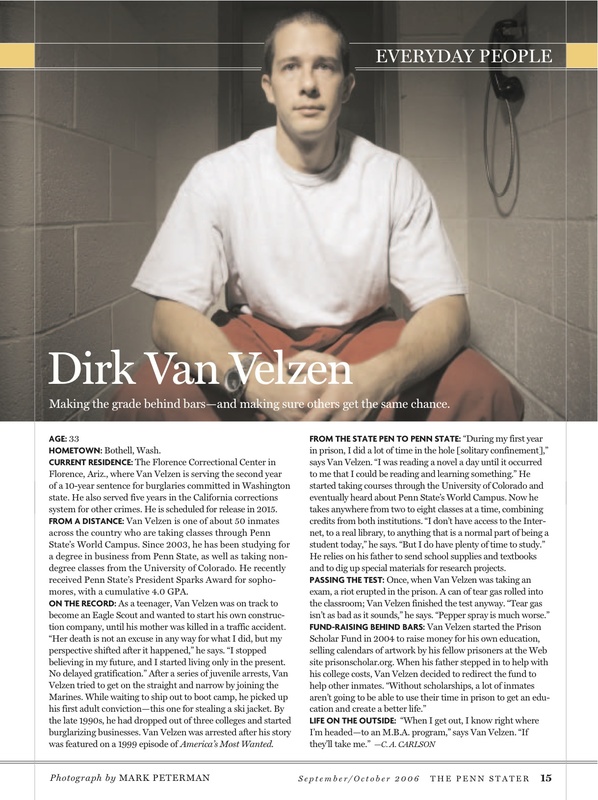 I’m hopeful that Van Velzen turns his life around and makes many positive contributions to society. BTW, I also love the fact that he’s taking courses via the World Campus. Great part of Penn State.